SUNLIT UPLANDS: Fighting Between Muslims and Christians in Central Nigerian Town of Jos Leaves at Least 16 Dead. Fighting Between Muslims and Christians in Central Nigerian Town of Jos Leaves at Least 16 Dead. At least 16 people were killed and 11 wounded in Nigeria’s central city of Jos in reprisal clashes between Christian and Muslim ethnic groups yesterday, said Pam Ayuba, spokesman for the Plateau state government. Hundreds of women and youth barricaded the highway between Abuja, the capital, and Jos today to protest renewed violence between the groups, Ayuba said by phone from the city. A family of four was killed in the predominately Christian district of Dabwak and 12 people died in an attack in the suburb of Babale, Ayuba said. On Sept. 3, unknown gunmen killed a family of eight in Jos, he said. 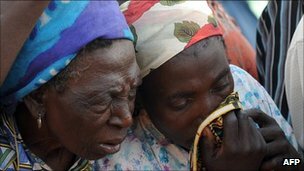 Nearly 70 people have been killed in Plateau state in less than two weeks in the latest violence between Christians and Muslims. Nigeria, Africa’s top oil producer and most populous nation of about 140 million people, is roughly split between a mainly Muslim north and a predominantly Christian south. The military deployed to maintain peace are “now mandated to use all the necessary force within its powers on anybody carrying and using arms or dangerous weapons,” after soldiers came under sniper attack on Sept. 2, Charles Ekeocha, a spokesman for the military task force in the area, said today by phone from the city. More than 14,000 people died in ethnic and religious clashes in the West African nation between 1999 and 2009, according to the Brussels-based International Crisis Group.